MMORPGs are well known for their guilds and strong communities and few online gaming guilds have survived the test of time as long as The Syndicate. Founded in 1996, The Syndicate has survived in the constantly evolving MMOG market and managed to maintain continuous operation since its founding. This is no small achievement and the feat recently earned them the Guinness World Record as the oldest online gaming guild. Check out the official release below for all the details along with an image of the award. 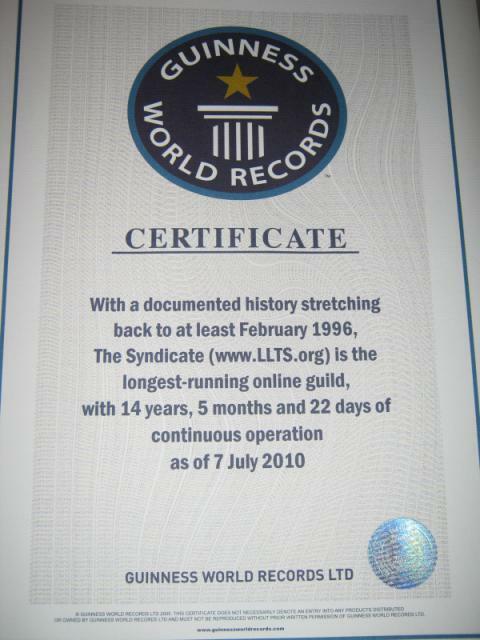 OCTOBER 1 2010 – The Syndicate®, an online gaming community composed of hundreds of members from around the world, was just awarded the Guinness World Record™ for being the oldest, online gaming guild. The specific definition of the record is: "With a documented history stretching back to at least February 1996, The Syndicate (www.LLTS.org) is the longest-running online guild, with 14 years, 5 months and 22 days of continuous operation as of 7 July 2010." While there were certainly online gaming groups that existed before 1996, the key measure for this World Record was "continuous operation." In addition to proving the founding date, to set this record an applicant must have proof of continual operation from independent sources. The Syndicate had a clear time-line with dozens of independent sources dated throughout its entire history with no gaps in the time-line at all. This is what allowed this record attempt to be measured and validated. Claims of being "old" are frequently made in the online world, but an exhaustive search into those claims revealed they fall into two basic categories. Those two categories are that the claims are often unverifiable by sufficient independent, trustworthy sources or the claims were not in "continuous operation" for their entire lifespan. "To obtain a Guinness World Record is no simple matter" said Sean "Dragons" Stalzer, President & CEO of The Syndicate®. "First, you have to determine if you can even apply for a record. There are all sorts of rules about what does and does not qualify as a record attempt. Second, you have to apply to be considered. At that stage you are evaluated on if your claim meets the criteria to be reviewed. Third, if you pass that stage then you have to prove your claim. In our case, we filed ourselves as the Oldest, Continuously Operating Online Gaming Community. Making that claim and having a website that says we are old means nothing in terms of setting a record. There is a very in-depth process which Guinness uses to determine if you should be awarded a record. You have to provide verifiable proof, from 3rd parties, that they can review, authenticate and then use to make a ruling on the record attempt. The Syndicate's nearly 15 years of history including our two Trademarks and more than 100 different articles, interviews, books and other publications were able to be analyzed and validated to prove our claim. Of course, I shouldn't discount the fact that we actually had to survive since 1996 which, in the online gaming world is a very rare feat." Guinness World Records™ for Online Gaming related topics are very rare. Ultima Online has a series of records associated with that game including the Longest Running MMORPG. Beyond that very limited amount of records on the books, MMORPGs and related Online Gaming topics are largely unrecorded in the tomes of the Guinness World Record™ books. As such, it is significant that another aspect of online gaming culture, the oldest continuously operating guild, has been immortalized within the record books.